OUR MISSION: To tap the potential of youth and inspire learning through playwriting. One of the first lessons we impart to students is that plays are written for the stage: that the words they write on the page are a blueprint for a three-dimensional world filled with people, places, and things—both ordinary and extraordinary, real and unreal. And that is the magic and opportunity of playwriting: the transformation of words on a page to life on a stage. ​The moment an actor breathes life into a student playwright's words, those words take on a new reality that affirms and amplifies the voice of the writer. It's a transformational moment at the heart of what we do. ​From the classroom, to the theater, to a room in a community center, a stage can be anywhere—the words, the voice of the playwright, is what matters. Since 1987, PYP has been working with educators and artists to cultivate the voices of youth, to cultivate joy in their life, and to affirm that what they say and think matters. 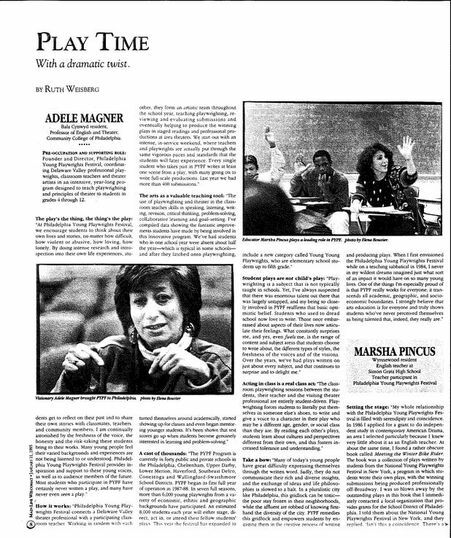 PYP mourned the untimely passing of Adele Magner in 2000. In the summer of 2001, the Board of Directors hired Glen Knapp as Executive Producing Director to sustain and advance Adele's outstanding legacy. Knapp led the organization through the next fifteen years, further advancing our focus on placing students at the center of all that we do. In 2016, Lisa Nelson-Haynes began as Executive Director to take Philadelphia Young Playwrights into its 4th decade.